Our New Galaxy S7 Cases Are Here + What You Missed At #Unpacked! You didn’t want to miss Samsung’s Sunday announcement at Unpacked, where they revealed two of their new flagship smartphones – the Galaxy S7 and Galaxy S7 edge. These two new revolutionary devices are the latest and greatest from Samsung, improving upon their previous Galaxy S6 and Galaxy S6 edge designs. One of the biggest stand-out upgrades? Their IP68 rating, which means both smartphones are essentially waterproof and dustproof, a feature Popsugar calls downright “insane” and awesome. 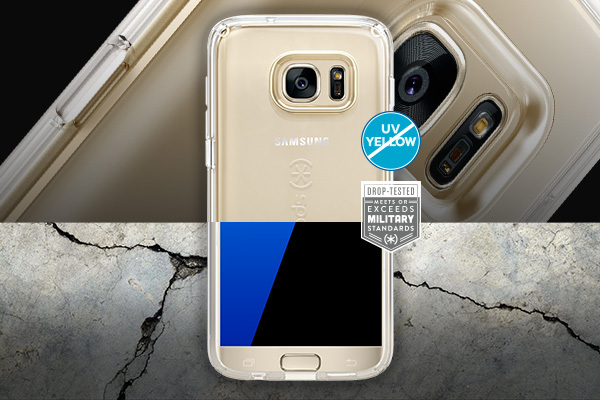 The new Galaxy S7 and Galaxy S7 edge feature the same back glass as last year’s model, with these top-notch trending colors: Black Onyx, Gold Platinum, White Pearl, and Silver Titanium for Galaxy S7 edge. Android Authority looks at some of these designs in an in-depth comparison to help consumers pick out the perfect color to match their style. In terms of aesthetics and grip-ability, Gotta Be Mobile says that the rounded edges, minimal camera bulge, and overall increased slimness of the phone will make it a fan favorite. So, why cover up the beautiful and unique color of your new Galaxy? Or even worse, disrupt the slimness that Samsung has worked so meticulously to produce in their new device? Protect your new favorite Samsung smartphone with the clear choice: Our CandyShell Clear for Galaxy S7 and CandyShell Clear for Galaxy S7 edge. With our proprietary UV yellow resistant materials and packed with Speck’s signature military-grade protection, you’ll be glad you opted for a case that’s designed for impact.